Healthy Children > Healthy Living > Nutrition > The Very Hungry Caterpillar > Healthy Eating at Home Matters! The Very Hungry Caterpillar eats many foods on his journey to becoming a butterfly. You can help your child on his or her own journey to grow up healthy and strong. Fruits and vegetables add important vitamins and fiber to your diet. At every meal, include some kind of fresh, frozen, or canned fruits and vegetables. Just be sure to watch out for those with fatty sauces or added sugar. Aim for at least 5 fruits and veggies a day. Just remember to avoid small, hard foods on which your child can choke, and cut any firm, round food (e.g., raw carrots or grapes) into long, thin slices. Add fruits and veggies to foods your child already likes: put blueberries in pancakes, chopped fruit on cereal, or small pieces of broccoli in macaroni and cheese. Make it fun: try cutting up food into fun shapes or making faces out of fruits and vegetables. Prepare and pack fruits and veggies as snacks for afterschool, after sports practice, and other times. Help your kids make the right food choices from an early age. You can do this by giving them two healthy choices to choose from, like an apple and an orange. It’s a great way for your kids to get excited about eating healthy foods. Let them decide what and how much to eat. Let them help you with small, kid safe jobs in the kitchen such as mixing ingredients and setting the table. Allow them to smell, touch, taste, and play with food. Eating breakfast helps your child start his day in a healthy way. Incorporate fruit and whole grains whenever possible. Children and adults who eat breakfast daily are less likely to be overweight. Try to set aside your meals as family time, and eat together as often as possible. Even babies can join family meal time. By age 9 months, they are able to eat on the same schedule with you. Create family meal times when they are little and keep this tradition as they grow. Download a printable guide that contains healthy eating tips and a reader’s guide to using The Very Hungry Caterpillar to encourage conversations about healthy eating. Print it out and share it with family and friends. Looking for more information? Be sure to visit the nutrition area of HealthyChildren.org. 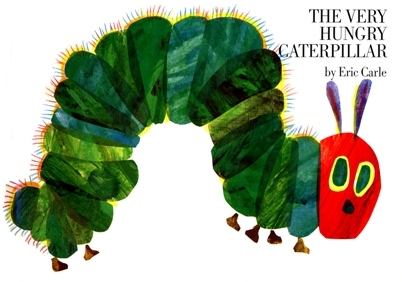 Also, visit Penguin Young Readers Group for activity sheets, videos, and more information about The Very Hungry Caterpillar by Eric Carle and Alliance for a Healthier Generation to learn how you can make healthy changes at home, in your child’s school and in your community.